This week’s review is of what I will call en “e-book” - a CD produced by Yves Masure called the Thailand Lexicon of Cultural History. From the outset, it should be pointed out that this is not a “Lonely Planet” on disk, but a totally different style of ‘publication’ - an electronic list and explanation of many cultural features in Thailand. The CD is the result of curiosity on the part of the author Yves Masure, who has spent the last two years compiling the disk. Masure had previously spent ten years escorting international tour groups on travel adventures and treks throughout many areas of Thailand. On these tours he took his camera, and some 3,000 selected images are included on this CD. The Lexicon is arranged in electronic pages, with navigation as per the usual internet methods, complete with back and forward buttons and links to other parts of the CD. One fascinating section deals with the history of the monarchy, and I must admit that this CD was difficult to review as I would become so interested in some particular aspect that I would read it and then follow the links to further sections, and on and on! The sections include Geography, with a map of Thailand and regional and provincial maps. 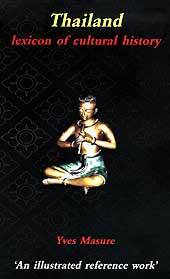 Religion and Mythology are covered along with Architecture and Iconography. The topics are numerous - History and Monarchy, Art and Literature, Traditions and Utensils, Ethnology and Hill Tribes, Nature and Gastronomy, Cities and Places of Interest and Crafts and Skills. With over 3,000 photographs, 76 provincial maps and over 3,500 terms, names and words, introductions on all types of Thai data, this ‘e-book’ is much more detailed than the usual guidebooks that try to be everything for every tourist. This Thailand Lexicon of Cultural History should be thought of as a reference book on Thailand, not as a ‘where to stay’ or ‘Thailand on 10 baht a day’ style of publications. The back cover for the CD does state that it is a “digital travel guide” but I found that it is much more than that. It does show you what you can expect to find and what the significance is. It does not tell you to catch the bus from Mor Chit! It should be available in Bookazine and all good bookstores, with an RRP of 799 baht. “What if tomorrow this war could be over? Isn’t that worth fighting for? Isn’t that worth dying for?” Stirring stuff from the lips of Morpheus as he rallies the people before the final battle at the beginning of Matrix Reloaded. ‘Matrix Reloaded’ followed in the present trend of Hollywood movies, where the sequel is better than the original. (Although I must admit to the plot being a bit too confusing for my associates Lang Reid and Dear Hillary, both of whom had their feathers thoroughly ruffled in the confusion of who was what, and where and when, Hillary kept on swooning over Neo though.) Harry Potter’s magical second movie certainly outstripped it’s predecessor; the Lord of The Ring movies just get better and better; Charlie’s Angels get sexier and sexier, and Terminator gets more rowdy by the minute. Perhaps the only one not managing to keep up with the trend is the Star Wars pre-quells, but then that was quite a hard act to follow. ‘Matrix Reloaded’ was a huge seminal step forward from the first movie, setting the bar even higher for the others to follow. The same can be said for the double CD collection that goes under the collective title, ‘Music from and Inspired by the Motion Picture’. Knocking the soundtrack from the previous movie into a cocked hat. The music is split between the two discs into inspired by and actual soundtrack. The first coming under the various artist category and the second mainly coming from the pen of the wonderful Don Davis. Opening song is ‘Session’ by ‘Linkin Park’, one of those bands that perhaps us old metal dogs have been a bit sniffy about in the past, because of their cross overuse of sampling and rap vocals. But this short little burst fits in very well here giving off just the right amount of vibes to set the Matrix groove, opening the door to the experience if you like. Certainly a band worth further inspection. Next song has a lovely quiet beginning with tinkling keyboards before slamming in with an almighty ‘More’ and a kick like Agent Smith X 20 smacking right into the pit of your stomach. The guitars slam and the vocals go from choirboy-like to full blooded roar. It is, of course, the magnificent new champion of shock/rock ‘Marilyn Manson’. By the end of this song you are right back in the Matrix. Marilyn Manson is the perfect artist to have on this collection with his song titled ‘This Is The New ‘Stuff’’. (It’s not actually called that, but the Mail is after all a family newspaper. Hillary went all peculiar when she saw what the real title was). Things are then slowed way down for three relatively forgettable tracks by ‘Rob Dougan’ - ‘Deftones’ and ‘Teamsleep’. Probably something for Trinity to relax to when she is not racing a motorbike the wrong way up the highway. Things are brought back with a bang to a more hard-edged sound with a couple of songs from ‘P. O. D.’ and ‘Unloco’, before ‘Rage Against The Machine’ weigh in with a slab of ‘Calm Like A Bomb’. ‘Oekenfold’ gives us ‘Dreadrock’, which sounds like an outtake from a bad seventies disco movie and doesn’t fit in at all well here. ‘Fluke’ then gives us ‘Zion’, which at least keeps the theme going. The remix version of ‘Dave Matthews Band’ ‘When The World Ends’ is appalling and would of been better left off the album. The second disc is pure class, the actual music written for the movie. Three pieces of music from Don Davis, two from the pen of Ben Watkins, and one co-written by the pair. Plus the pulsating ‘Chateau’ from Rob Dougan. This music lives and breathes Matrix. The ‘Main Title’ sets the scene; ‘Trinity Dream’ is the stuff nightmares are made of; and ‘Teahouse’ is the music from the dance ritual in the movie, where Neo and Trinity get it on, while Link and Zee give it the Hoochie Choochie. (Let’s hope we get more of Zee in the future.) ‘Chateau’ has the heaviest bass line ever, almost knocking you out of your seat as Neo does his Superman thing. Then with over ten minutes of ‘Mona Lisa Overdrive’ you can almost feel the Keymaker hanging on for dear life as Trinity weaves through the oncoming traffic. The ‘Burly Brawl’ brings out the best of Neo as he battles two, twenty, two hundred Agent Smiths. Any Army marching to battle with this as their battle cry would turn into a bunch of berserkers. 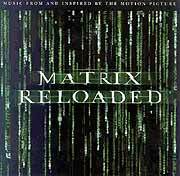 Then to finish off the music is the ‘Matrix Reloaded Suite’, where Don Davis is able to bring all the threads that musically tie the Matrix together during its nearly 18-minute length. Very impressive it is too, bringing out all the best parts from the related music, sometimes slow, sometimes loud, but always dramatic. A very impressive way to end this collection of songs. The second C.D. also includes extras that you can view on your computer. We now wait with great anticipation for the third and concluding part of this trilogy Matrix Revolutions. The movie should be great. Let’s hope the soundtrack is too. NOTE: The Matrix Revolutions is being released worldwide in the cinemas (even in Pattaya) on Wednesday November 5.